3. What Does .PK Mean After a Stock Symbol? At least once a year, it’s important to take stock of how far you’ve come and where you’re going. For a business that opportunity comes in the form of an annual report. But the audience as well as the Securities and Exchange Commission's reporting requirements determine the type of report the business prepares. What Is a 10-K Report? When a company sells shares on the stock exchange, the SEC takes an extra interest in its finances. For that reason, certain companies are required to file a report each year updating its performance. This report is called a 10-K. Although it’s similar in content to a basic annual report, the 10-K typically has much more detail than a business would include in its annual report. A company doesn’t have to stop doing an annual report once it goes public. However, instead of doing both an annual report and a Form 10-K, some publicly-traded companies choose to send the 10-K to shareholders as well as the SEC. There is much more flexibility in an annual report, particularly if your business is small. An annual report is a document a company prepares each year to detail its performance. Although any business can create such a document as a way to measure progress and set future goals, once a company has shareholders, it’s usually a requirement. By having this report in hand, shareholders can easily track how a business is performing. Instead of unpleasant surprises after consecutive years of losses, shareholders will be able to track changes from one year to the next. Annual reports may also be later requested by potential investors and creditors. Who Files a 10-K Report? Companies that have a registration statement for a public offering in effect are required to file a 10-K, but they aren’t the only ones. If a business has more than $10 million in assets held by 2,000 or more people, a 10-K is required. They’ll similarly need to file a 10-K if 500 or more of their shareholders aren’t accredited investors, or if the business’s securities are listed on the U.S. stock exchange. There are exceptions to this rule, though. You can exclude those who own shares that they obtained as part of an exempt offering if it was included in an employee compensation plan. There are also some instances where you can exclude shareholders who bought stock as part of a crowdfunding effort. If your business owns assets worth more than $10 million and has 500 or more shareholders, though, you may want to take a look at the SEC’s Exchange Act Reporting and Registration requirements to see if you need to file. There are five major components of a 10-K, with businesses personalizing each of those sections with their own information. It kicks off with an overview of the business, followed by the risk factors the company faces and a five-year overview of its financial data. It then progresses to Management’s Discussion and Analysis of Financial Condition and Results of Operations, which is where the business has the freedom to summarize the past year, and ends with financial statements. In your 10-K, you’ll need to have signed statements from your CEO and chief financial officer. They’ll swear in these statements that everything in that report is factual to the best of their knowledge. Once you’ve filed the Form 10-K, it becomes public information, and anyone considering buying stock in your company can access it. An annual report can be formatted any way you choose since it’s designed primarily for your own shareholders. You can find templates online or in the templates provided with your word processing software. The goal is to provide a detailed accounting of your business’s financial health. As with the 10-K, you’ll likely include detailed financial statements as part of your report. But you’ll also break them down using your own narrative. You’ll do this through a letter to the shareholders from your CEO, a section with operational and financial highlights and notes that you append to the financial statements. After a business has submitted its 10-K filing to the SEC, it becomes available for public viewing. You can find PDF versions of the 10-K on the SEC website. This site lets you search for forms or sort by date to find the latest-filed reports. If you’re a shareholder of a business, you can request a copy of its 10-K if it hasn’t been given willingly. Whether you’re a shareholder or not, though, you may be able to find a copy of a company’s 10-K on its website. As part of filing, businesses are asked whether they provide their 10-K free for viewing on their websites. 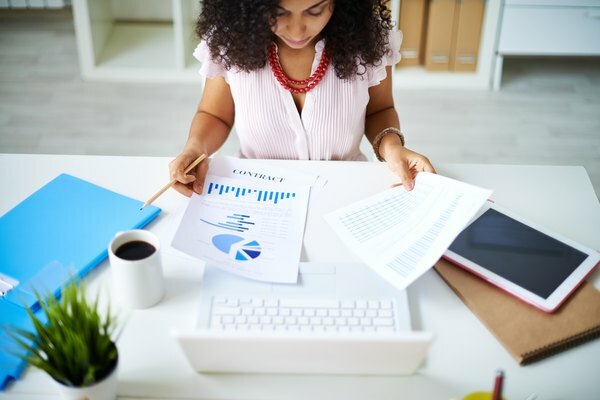 If you’re thinking about investing, or simply want to see an example of what other businesses are doing, you can look up annual reports for a variety of companies online. AnnualReports.com offers a searchable database, as does Nasdaq.com. If you have a specific business in mind, check their website and, if it isn’t there, feel free to request a copy. If you’re considering investing, they may be happy to let you see it. It’s important to note, though, that the version of the annual report you see may be cleaned up for public consumption. Unlike the 10-K report, businesses aren’t required to include letters from the CEO and CFO certifying the information is accurate. You may get a little confused if you hear the term 10-Q tossed around. A 10-Q report can be easily mixed up with a 10-K report since they’re very similar. Generally speaking, a 10-Q report is less detailed than a 10-K. Unlike a 10-K report, the 10-Q report must be filed within 40 days of the end of each quarter. With a 10-K, the financials that are included have usually been audited. Due to its short turnaround time, though, the 10-Q’s financials are likely unaudited. It also covers a shorter time period, which makes it brief by its nature. In addition to the 10-K filing once a year and the 10-Q after each quarter, you’ll also need to know about the 8-K form. This is a form you submit when a special event occurs that you need to report to the SEC. Events that might prompt an 8-K include a bankruptcy filing, acquisition or resignation of a key member of your board of directors. If you have an eligible event, you’ll have four business days to submit an 8-K. One exception to this deadline is if you have an event listed under the Regulation Fair Disclosure requirements listed by the SEC. This applies to information that could affect shareholders’ trading activities and, in those cases, you’ll need to submit Form 8-K as soon as the event happens. The SEC has strict deadlines for filing the appropriate form related to your business finances. If your business is a large-accelerated filer with a public float of $700 million or more, you’ll need to have your 10-K form within 60 days of the end of your fiscal year. For businesses considered accelerated filers with floats of $75 million to $700 million, that deadline is 75 days from the end of your fiscal year and 90 days for businesses with a public float of less than $75 million. Deadlines also vary with the 10-Q. Both large-accelerated and accelerated filers must have their 10-Q forms to the SEC within 40 days of the end of the quarter. For businesses with public floats of less than $75 million, though, that deadline is extended to 45 days. Chairman’s Letter – The chairman’s letter can actually be one of the most telling parts of the 10-K. If possible, gather multiple years of reports and compare what the chairman says from one year to the next. Were they able to accomplish the goals the chairman outlined in a previous year’s letter? Risk Factors – Item 1A details the risks a business faces. They’re urged to only list risks that can affect the securities that are being offered. Risks can include lack of an operating history and unprofitable operations in the most previous period. Financials – Item 6 will provide a brief overview of the company’s financials over the past five years. If you’re considering investing, this could give you a decent picture of where the company may go in the future. Management’s Discussion – Item 7 gives the business the opportunity to offer its own perspective on the previous year’s results. You may also find here a few risks you should take note of before investing. Financial Statements and Supplementary Data – Item 8 has all of the appended information you’ll need to get the full picture of how the company performed. This data will have been audited and has the business’s income statement, balance sheets, cash flow statements and the statement of stockholders’ equity. Even if you’ve pulled Form 10-K and scrutinized the information, you may find it’s tough to put the information you’re seeing into context. Another proactive measure you can take before putting a dime of your hard-earned money into a stock is to look into its competitors. You can do this by pulling annual reports, 10-Ks and 10-Qs for its direct competitors. This will allow you to measure its performance and outlook against others in the same space. Another benefit of looking at the financials of competitors is that you’ll have a point of reference for comparing various business structures. Not only will this allow you to note how they each allocate their money, but you can also identify risk factors and see how various businesses are protecting against them. You don’t have to rely solely on the 10-K filing to gather information on a business’s performance. Public companies generally hold quarterly calls with all of their investors in which they review the previous quarter’s performance. Instead of digging through pages and pages of reports, one of these phone calls could give you all the information you need to know to move forward. The Nasdaq Composite website provides a public calendar listing all the upcoming earnings calls. Once the call has happened, you can generally find information on what was revealed if it’s a high-profile company, and corporations like Apple even invite the public to sit in on their calls. If you miss the call, you should be able to access a full transcript after the fact either directly through the company or through Nasdaq’s Conference Call Transcripts page. AllBusiness: What Is SEC Form 10-K and Where Can I Find It? Cornell Law School: 17 CFR 229.503 - (Item 503) Prospectus Summary and Risk Factors.